Dogs are incredibly smart and talented creatures, and they are a blessing to have in our lives. Every new doggy parent is armed with a few standard tricks to teach your dog for basic obedience – sit, down, stay. But have you guys considered some other handy tricks that will not only increase the bond between you and your pup, but also make your life a little easier? We’ve all been there, cuddled up in bed with a nice book and hot cup of tea. Before you know it, it’s time for a good ol’ nap… but that light switch is just so far away! Teach your pup how to turn off the lights and problem solved – you don’t have to move from your warm and comfy spot, and your pup gets a cookie and pat on the head. For small dogs that can’t reach the light switch, consider using a chair or platform they can jump on to reach. Here is a great guide for teaching your dog this handy trick. Dogs love toys, and we love to spoil them with toys. Chances are you have a toy bin or pile somewhere in your house dedicated to playtime for your pooch. If your dogs are anything like mine, they love digging through their precious pile and bringing out their beloved toys one by one, leaving a lovely scattered array of stuffed squirrels and squeaky balls all over your living room floor. Teaching your dog to clean up their toys will keep your home squeaky clean after playtime, and it’s another impressive trick to show your guests when they come over! This video will teach you how to teach them this trick. 3. Shake (for a pedicure). 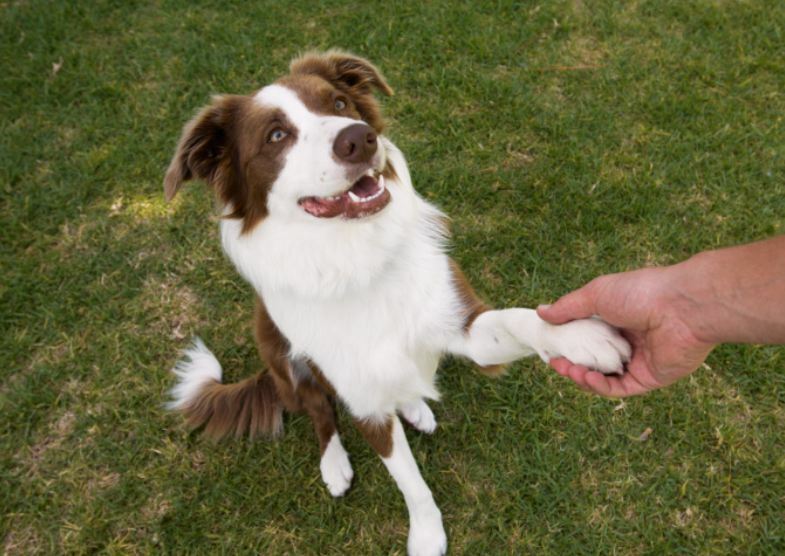 Teaching your dog to give their paw for a handshake is a pretty standard trick that’s easy to teach. The next part is getting your dog to leave their paw for a quick nail trim, which can be a struggle for many pups. This extensive guide is a good place to start. The trick with this one is to take it slow, and incrementally adjust your dogs to getting their nails clipped, buffed, and painted (okay, maybe not the last one). Teaching your dog “BANG!” or to play dead is not only a great party trick to show off to your friends, but also is a great tool for encouraging your dog to relax. This guide shows you how to teach this trick. Plus, it’ll make your vet’s job easier when they’re doing their routine belly exams. This trick is super useful for getting your dog somewhere you want them to be. One of the basics that is often taught in beginner or puppy obedience classes, teaching your dog to touch your hand is another way to get them to come to you. Do this by holding out your hand and treating (or using a clicker, if that’s your preferred training method) your dog every time they sniff and then touch the empty hand with their nose. Eventually they will get the hang of it! 6. Put their collar on. It’s like teaching your kids to put on their own clothes! … just kidding. This is a variation off of “touch,” teaching your pups to put their heads through their collars or through a slip leash. I use this one all the time for my American Eskimo, because having a collar on all the time when she’s running around the house tends to mat her fur. This way, she knows how to put on her own collar when we’re ready to head out. Do this by holding the collar in one hand, and putting your other hand behind the collar. Use the “touch” command. 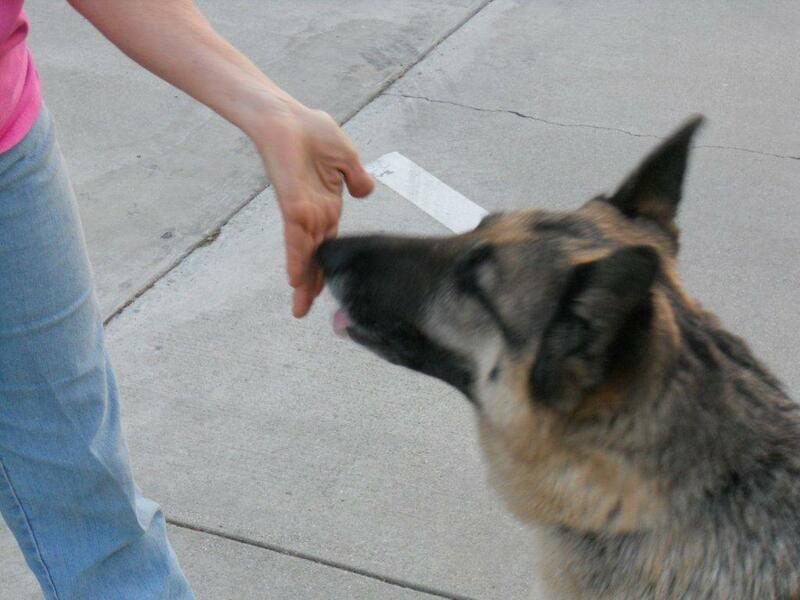 Your dog will aim to touch your hand and put their head through the collar in the process. Very handy for dogs who squirm around when putting collars and leashes on!